Update: After speaking with the authors of the Learning Policy Institute report and reading their written rebuttal, I made some changes to the post below and have written a longer piece clarifying the issues here. Earlier this month the Learning Policy Institute (LPI) released a report with the worrying title, “A Coming Crisis in Teaching? 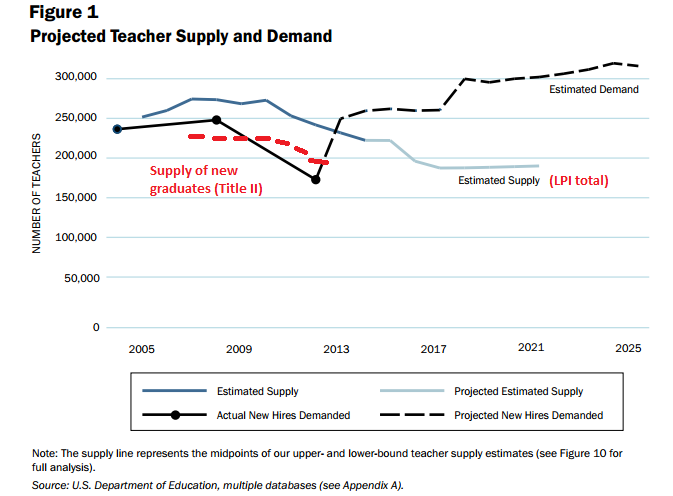 Teacher Supply, Demand, and Shortages in the U.S.” Although initial coverage mainly took the report at face value, others have started to push back. The National Council of Teacher Quality’s Kate Walsh noted that teacher supply and demand levels look very different depending on state and subject. Mike Antonucci pointed out that we’ve heard the same “teacher shortage” cry before (by the same people), and it turned out to be very, very wrong. And Dan Goldhaber took the long view by pointing out that, contrary to the current narrative, we’ve ramped up teacher production significantly over the last few decades. In fact, Goldhaber’s piece contains an important but subtle distinction about the LPI report. (Updated) Notably, LPI’s estimates for the total supply in a given year are so low that they nearly match just the number of people who complete a program in that year. The National Center for Education Statistics (NCES) estimates there are 140,000 to 200,000 “new entrants” into the teaching profession. NCES buckets new entrants into three categories: those who are are returning to teach after time out of the classroom, those who have never taught before but who delayed their teaching career, and those who recently graduated from a teaching program. These buckets are distinct categories of people, but you can start to see why it gets murky. Every year, the majority of new teachers hired are NOT recent college graduates. Among all teachers considered by NCES to be new entrants, only about 40-45 percent are people who are coming straight out of a preparation program. The LPI report confuses these sources of new teachers. They estimates a generic number for “teacher demand” at roughly 200,000 teachers, growing over time to more than 300,000 per year. This is worrying because as a country, only 200,000 to 250,000 people complete a teacher preparation program each year, and those numbers are likely to fall in coming years. LPI compares these sets of numbers and concludes that we’re heading for a severe teacher shortage in coming years. (Updated) But LPI’s figures are misleading, because their supply figures assume many people who trained to become teachers are not part of the teacher supply. For example, in 2004, LPI says there was demand for 236,407 new teachers. According to NCES, that year there were only 74,500 new hires who were recent college graduates. LPI repeats the same error in 2008, where it reports 247,964 new hires, even as NCES says only 92,500 of them were recent graduates. The numbers aren’t readily available for more recent years, but it’s clear that LPI’s figures are way out of proportion. This wouldn’t be a problem if LPI noted these distinctions. Instead, they compound their error by comparing apples and oranges. They compare their figures for total demand against the supply of new graduates. As it should be clear by now, those two figures are not actually comparable. A better comparison is to look at the number of recent graduates who are hired versus the total production of recent graduates. When you look just at recent graduates, you get very different numbers. Once you start comparing apples to apples, LPI’s “teacher shortage” narrative goes completely out the window. I’ve taken Figure 1 from their report and added the data from NCES on hires who were recent graduates in a given year (in red). Contrary to LPI’s image of demand outstripping supply, the actual lines never cross. If we assume that historical patterns hold, we still won’t pass the supply/demand break-even point anytime in the near future. Now, these are national totals, and they don’t touch on shortages in certain subject areas or geographic regions. But an honest accounting of the numbers shows that there is no generic, national teacher shortage. This entry was posted in Politics of Education, Talent, Teacher Effectiveness and tagged Learning Policy Institute, teacher shortage on September 26, 2016 by Chad Aldeman.